The puff stitch is a crochet stitch that forms double-sided bobbles that are both thick and fluffy. You can use these stitches to create smaller motifs, work a row of puff stitches among other stitches, or crochet rows of the stitch to make a puff stitch fabric. Although getting the tension correct can take a little practice, puff stitch is basically a variation on half double crochet. Instead of completing the HDC as usual, you add more loops, resulting in the "puff". There are several variations on puff stitch, often based on the number of loops and the size of the puff stitch. You can also work staggered puff stitch rows as you see here, as well as stacked, zigzag, braided, and more. Work with a yarn that isn't prone to splitting and a crochet hook in the size recommended on the label. Make a starting chain in a multiple of 2 stitches + 4. Wrap the yarn over the hook and insert the hook into the fourth chain from the hook. Yarn over again and draw up a loop. You should have three loops on your hook. This is the beginning of a half double crochet stitch. Instead of drawing the yarn through these loops, continue on to the next step. Yarn over, insert your hook through the same chain stitch, yarn over, and then draw up another loop. You should have five loops on the hook. Repeat the previous step until you have the number of loops on your hook as needed for the puff stitch you're making. Some puff stitches have as few as five loops on the hook, while others may have 11 loops. Be sure to follow the instructions for the pattern you're using. The puff stitch you see here stopped at nine loops. When you have as many loops as you want on the hook, yarn over and draw it through all the loops. Depending on how tight the stitches are, this can be a little tricky at first. That's because every other loop (the yarn overs before you insert the hook) is smaller than the others. Draw the hook through, wiggling it a little as needed, to avoid pulling those loops. This completes the puff stitch, but there's one more step that you typically need to follow. With the loop pulled through the puff stitch, make a single chain. This secures the puff stitch, keeps the stitch more upright, and creates the space to work into on the next row. Remember though, not all puff stitches are the same. Pay attention to the instructions for whatever pattern you're using to make sure this chain is part of the variation you're working. When working across a row, skip one chain and work another puff stitch into the next chain. Follow this across the row. Make a puff stitch and skip a chain. You should end with a puff stitch. At the end of your row, flip your work and make a turning chain of three chain stitches. Make your next puff stitch in the chain-1 space from the previous row. Follow the same steps for the stitch across the row, but instead of skipping chains, work a puff stitch into each space along the row. You should end with a puff stitch. As you add rows, the stitches should look staggered with a slight lean going in opposite directions for each row. If you work this stitch in the round, all the stitches will lean the same way. Want to make your puff stitches a little taller? Pull your hook away from your work as you draw up all the loops. This makes the stitch looser and gives it more height. 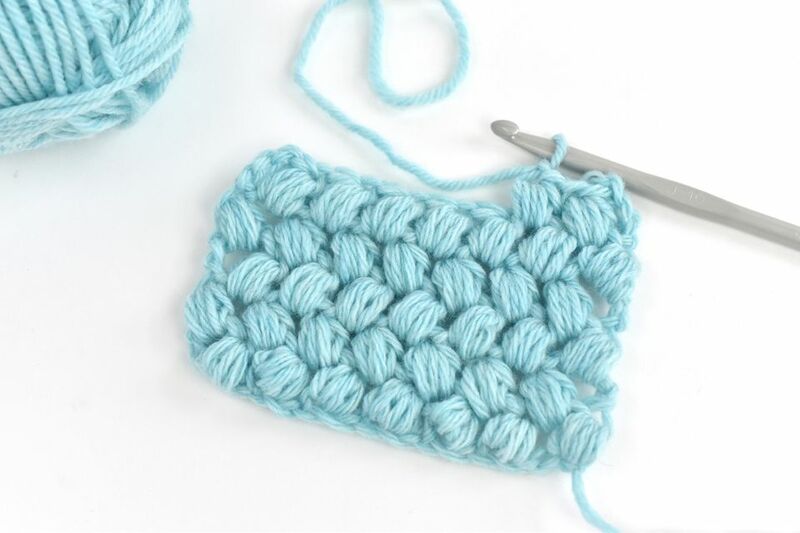 Ready to try this stitch a few times on a small project? Make a crochet snowflake with some tiny puff stitches!